Ray has composed music throughout his life. He made up his first song, with words and melody, at age 4. 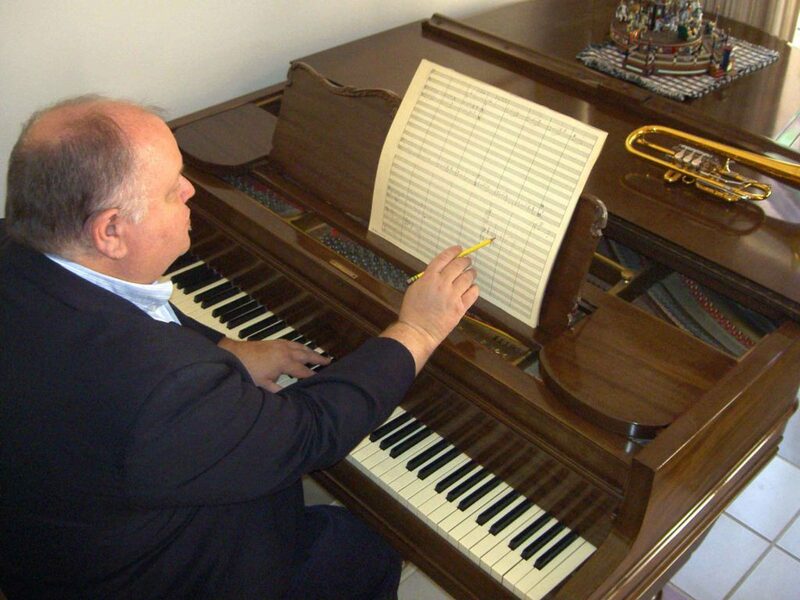 In middle school, he often imagined writing music for a band of his friends, and in high school he started composing songs and small instrumental works. He wrote his first serious works as an undergraduate and was first published in FEAST, Occidental College’s annual Arts and Literary Review. 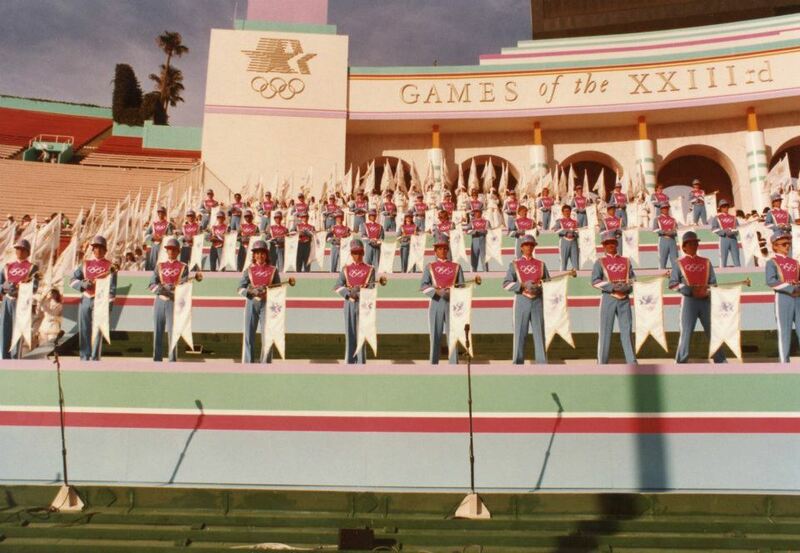 Excerpt from Ray's "Quintet for Brass"
The mid-1980s were a big time for trumpets and fanfares in Los Angeles, because of the 1984 Olympic Games held there and the Olympic Fanfare Trumpeters, which were featured during opening and closing ceremonies. As one of these 112 trumpeters, Ray soon found himself booking corporate fanfare trumpet gigs, and it seemed natural to offer to write original fanfares for these clients. 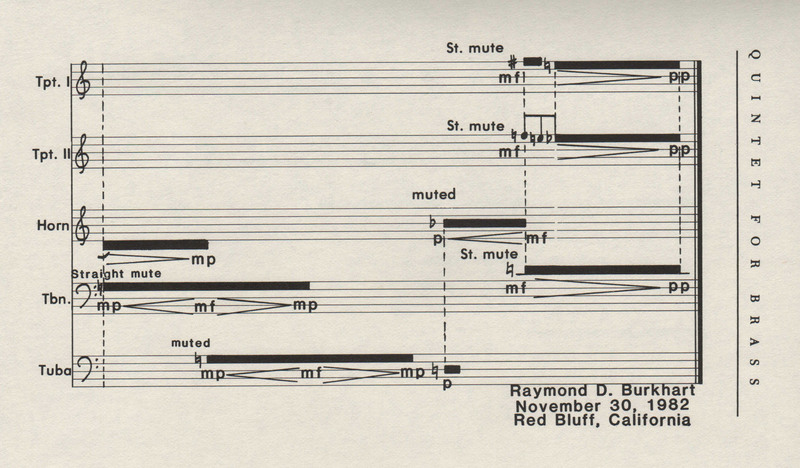 In 1986, when asked to provide ten minutes of continuous trumpet fanfares for the Los Angeles appearance of the Choir of St. George’s Chapel, Windsor in their first-ever US tour, Ray offered to compose a new work for three trumpets and organ, thus saving three trumpeters from an early audience with Gabriel. FANFARE PROCESSIONAL was the result and immediately became popular in Southern California for big events, concerts, weddings, and recitals. It has been performed in many states and countries, as far away as Russia. First page of Ray's "Fanfare Processional for the Choir of St. George's, Windsor"
With the 1990 premiere of his DOUBLE CONCERTO FOR FLUTIST, TRUMPETER, AND ORCHESTRA, Ray started Premiere Press to publish his music. His publications now number in the hundreds. He has fulfilled many commissions for orchestra, band, choir, and chamber music, but he might be best known for his brass chamber music. You can read HERE about commissioning new music. 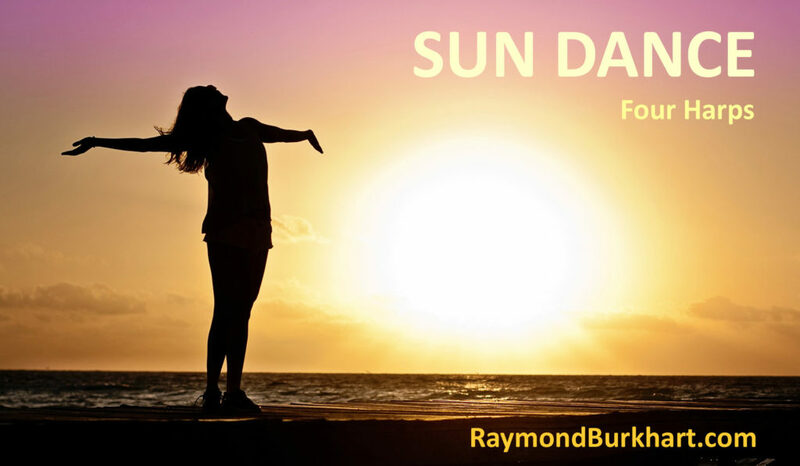 Ray has received 20 ASCAP awards and is a two-time First Prize winner of the Humboldt State University Brass Chamber Music Workshop Composition Contest: LOVE LETTERS (2004) for Seven Brass and BOUQUET DE BRASS (2005) for Six Brass. 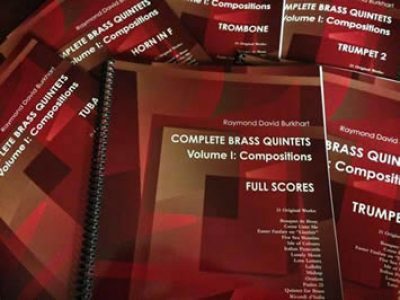 Premiere Press also publishes Ray’s book, BRASS CHAMBER MUSIC IN LYCEUM AND CHAUTAUQUA, his COMPLETE BRASS QUINTETS, and his CD, WATERCOLOR MENAGERIE, which features 14 of his works recorded by the Premiere Brass Quintet. 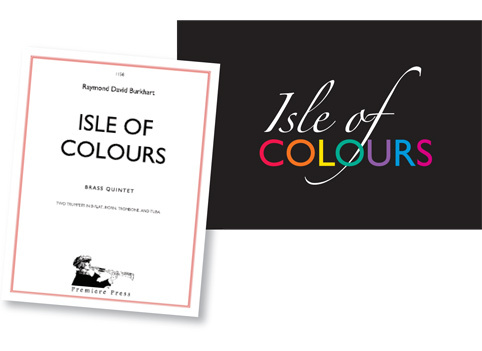 Use these links to purchase Sheet Music, Recordings, and Books, or use the “Shop Premiere Press” menu. 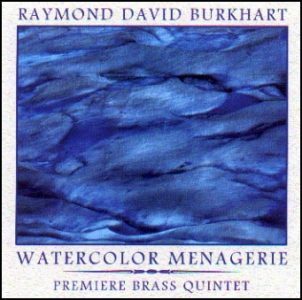 RAYMOND DAVID BURKHART: WATERCOLOR MENAGERIE. CD. 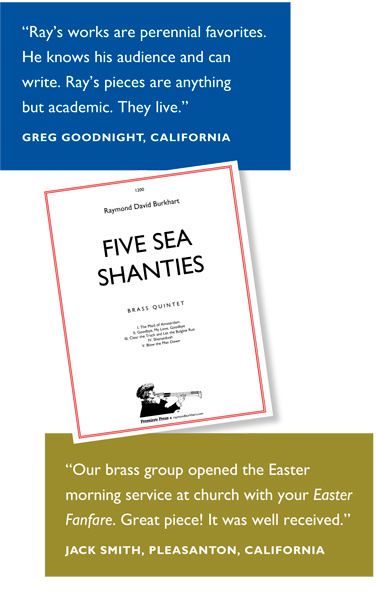 The Premiere Brass Quintet plays 14 original works. FANFARE PROCESSIONAL for the Choir of St. George’s, Windsor. 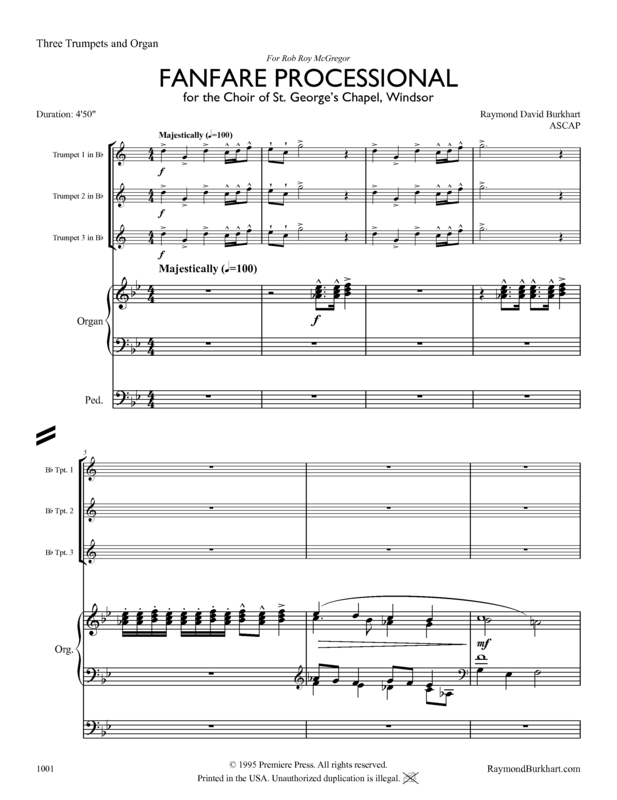 Single mp3 of this popular composition for three trumpets and organ. CELEBRATION. CD. Two of Ray’s hymns are featured on this recording of concert versions of 26 hymns from the new Christian Science Hymnal. FIAT LUX. CD. Three of Ray’s Christmas arrangements for ten-part brass are included in this recording from McGinty Music: “Swingle Bells,” “The First Noel,” and “Tomorrow Shall Be My Dancing Day” (from Three Renaissance Carols Reborn). TECHNICALLY SOUND. CD. Caltech Concert Band performs Ray’s arrangements of CALTECH MEDLEY and THE THROOP INSTITUTE MARCH. COME UNTO ME. SATB choir and trumpet. Commissioned by Jannette Carothers for the Glendale Presbyterian Church Cathedral Choir. THE LITTLE CHILD. 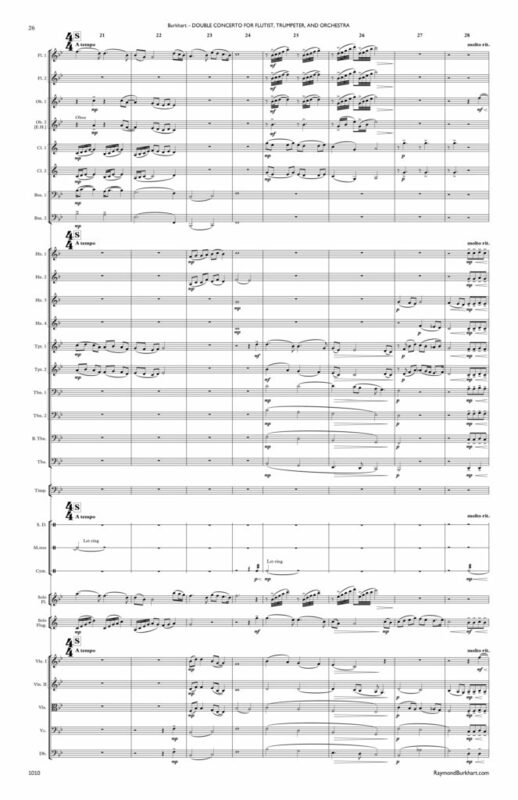 SATB, eight brass, percussion, organ, narrator. A Christmas cantata commissioned by Claremont Presbyterian Church and Glendale Presbyterian Church. AULD LANG SYNE. SATB choir. Commissioned by The Cathedral Choir of First Congregational Church, Los Angeles.